The moment you step onto the old stone steps leading into the courtyard, you will get the feeling of softly gliding back into history. A host of finely made wooden Mashrabiyas, overlooking the courtyard as well as the facade of the building , remarkably come into view, almost confiding the 500-year history of this architectural masterpiece. 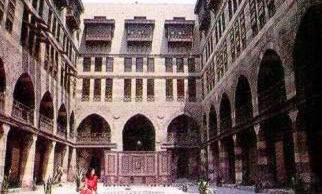 This Mameluke-style building is cozily situated amidst the historical district of Al Azhar, Downtown Cairo, which is remarkably rich with Fatimide and Mameluke monuments. The external stone facade is impressive, with its uniformity of windows. There are a few small windows on the first floor, but the upper stories of the building have three rows of groupings of three windows of varying design. The last row is covered by mashrabiya panels, each panel being three windows wide. The entrance to the courtyard is via a great door mounted in a trilobate arch. Inside, the building is very regular, with the exception of the first floor, which has wide arcades intersected by a gallery. The cultural role of Wakalat El-Ghouri started in 1959, with the initiation of the Egyptian Ministry of Culture. It was then selected as the seat for reviving conventional handicrafts as well as housing ateliers of contemporary artists. The object was to effect an interaction of both originality and modernity. The antique building at present comprises ten handicraft departments, side by side with fifty ateliers for plastic artists and six non-governmental organizations head-offices for artists critics, museum lovers and arts and heritage sponsors. Wakalat El-Ghouri, thus provides an unprecedented example that epitomizes a happy cultural marriage of the old and modern and governmental and non-governmental. The common objective is to enrich the cultural scene with a variety of arts and cultural feeders. This will ensure that, while enhancing national identity and allegiance, we will remain open to modernity. Art and life Center, located at Sabeel Um Abbas , Al Khalifa District ( Sabeel is the Arabic word for public fountain house, built in Egypt during the Fatimide Mameluke period to provide drinking water to passers-by ). Conventional Art Research Center, located at Sabeel Al Sultan Mahmoud, Sayeda Zainab District. Pottery Center, Al Fustat, Old Cairo District. A glimpse at the products of the Canvas Embroidery Department at Wakalat el Ghouri, will show how beauty can be accentuated through perfect workmanship. It is a sheer pleasure looking at colored strips and ornamenting fabrics and household items. It is still more delightful to watch artisans' magic hands stitching these pieces so adroitly and finely that one can hardly notice any traces of a stitch. This art had originally started with the Tartars, moved to India, then to Egypt , during the Mameluke period. Colorful clippings, arranged in geometric forms, are used to adorn household beddings, upholstery, drapery and wall-hung panels. This art was widely used in Egypt, particularly in canvas pavilions. At times, this handicraft was undermined by the far easier but less artistic techniques made available at present by modern technology. This graceful conventional art was soon abandoned for silk screening and craftsmen no longer used magic (invisible) stitches to darn fabrics. Thus, artisanship and artistic perfection diminished. Yet, with the initiation of this department in Wakalat el Ghouri, originality, closely linked to these skills and crafts, came to be gradually restored and brought into use through modern techniques in costume embroidery alongside with embroidery threads. This is another graceful and extra fine Islamic art, that noticeably appears in almost all mosque windows and palace halls, dating back to the Islamic era. This art is applied on plaster panels with hollow frames, filled with colored glass units in decorative, geometric or botanical shapes. Since the early sixties, efforts to restore and revitalize this dying art were started by Wakalat el Ghouri. Additional branches of this art were introduced, including gypsum cornices, skirting and Muqarmasas (embossed cubiod ornamental motifs used in Islamic architecture). Modern uses of inlaid glass cover decorative mobile partitions, hanging lights (such as chandeliers) and wall panels. Jewelry used by women in various regions of Egypt are distinctly different in style and forms. A variety of handmade jewelry is displayed at the Folk Jewelry Department of Wakalat el Ghouri. The history of this craft has it that jewel-making flourished during the Abbasite era, characterized by general welfare and luxurious living, as a result of the Islamic Conquests, increasing resources of the state and revival of science, arts and industry. However, this art soon declined in the later years, but subsequently flourished again in the Mameluke period. In Egypt, unique distinct forms of jewelry were developed, with variations depicting geographical differences. For example, jewelry made in Upper Egypt is different from that in Lower Egypt or Sinai. Some jewelry actually express the personality of women in each region. Wakalat el Ghouri has a rare collection of traditional costumes, representing various parts of Egypt, including remote areas such as Siwa Oasis, Al-Khariga, Al-Dakhla and Al-Bahriya Oases, Upper Egypt governorates, Sharqia, Al-Behaira, North and South Sinai governorates. With the lapse of time, many of the popular costume styles and models were virtually reaching the verge of extinction. Taking this situation in mind, intensive efforts are being exerted in this Department to re-create, re-reproduce and seek inspiration from conventional costume designs, in order to produce models, that, while maintaining the specific features of the respective costume styles, would meet the taste and requirements of the time. Conventional embriodery and other decorative elements of canvas embroidery were also introduced. Marble engraving has been a flourishing handicraft in various eras in Egypt. Marbles of various types and colors were used in beautiful forms on grounds, facades and fountains. However, this art has been recently dying. It is proposed that the introduction of a marble work department in Wakalat el Ghouri will help revive this art. Based on the use of stone, glass and aesthetic formations on walls and fountains. The Mosaic Department is to be created under the development plan of the Fustat pottery center. Sculptures on display in the Islamic Art Museum contain wooden and stone formations of botanical, animal and human figures, which refute the widely circulated misconception that Islam stands against the art of sculpture. This school of art tends to be rather instinctive or naive, and extends deep into popular heritage. Blown glasswork was one of the most widely known arts which flourished during the Mameluke era. The number of glass works operating at that time rose to 360. This art is used in making colored glass utensils, cups, Islamic-style niche lamps (Mishkas), bottles and pitchers. At present, there are three workshops applying this art, in addition to a fourth workshop at the Fustat Pottery Center, that make colored glass pieces required for the art of mosaic. As a basic element of the Arabic language, Arabic calligraphy has always played an important role both as a manifestation of pan-Arab unity and a form of , uniqueness and. With the advancement of computerized printing, craftsmen involved in this beautiful art have been diminishing. The discovery in Wakalat el Ghouri of the hidden secrets of Arabic calligraphy dating back to the 16th and 19th centuries was instrumental in reviving interest in and study of Arabic calligraphy. These form the curriculum of the free study atelierhas , already set up in Wakalat el Ghouri, in collaboration with Asala Society. (an NGO). Ouya is the colloquial Egyptian word for the very fine decorative elements beautifully fixed on women head scarves, widely used in the Egyptian countryside and the traditional districts of Old Cairo. It is a complementary art to folk costumes and is an integral part of country women's ornaments. In order to encourage this art, it is being introduced at the Art and Life and Conventional Arts Research Centers. During the Islamic epochs, decorative book binding reached high levels of craftsmanship, through the use of embossed decorative motifs, gold-plating and coloring. Although many a masterpiece belonging to this art were achieved in the past, it has been deteriorating almost to the point of extinction. Studies are underway for reviving this art through Wakalat el Ghouri free-study ateliers. Beautifully designed leatherworks such as bags, belts, medals, shoes and cushions, that combine both functional and aesthetic value are made, using ornaments and graphics by burning and collating. Egypt has a unique reputation in this field. The Leatherwork Department is to be set under the conventional Arts Research Center. The Arts Centers, as appears from the foregoing presentation has been pursuing its mission of supporting, restoring and reviving traditional handicrafts, within the object of maintaining our cultural identity.